Potatoes and cabbage have been sustenance foods in Ireland for ages—during Medieval times these ingredients were readily available to the common man. 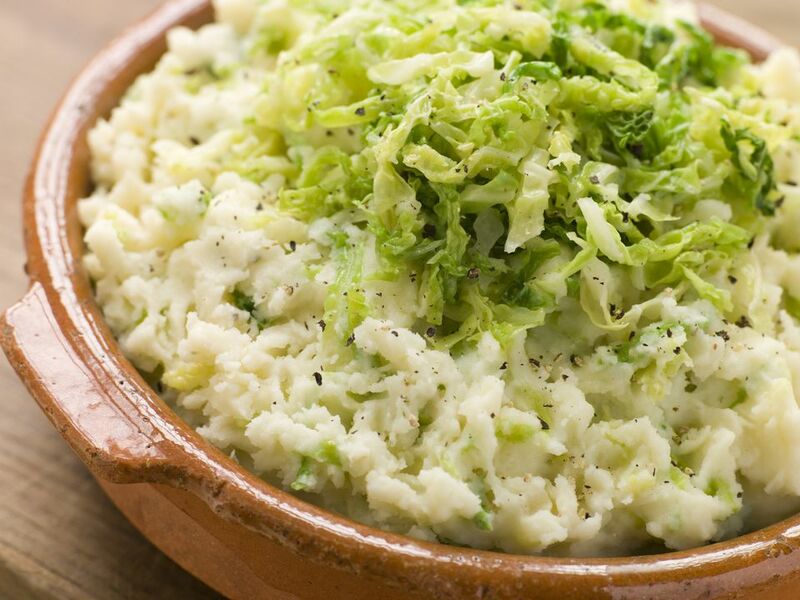 This classic Irish dish combining these two ingredients into a rich and satisfying side may have originated as early as 1735, but the first reference to "colcannon" is known to be in Cassell's Dictionary of Cookery in 1875. There are many variations—some including kale instead of cabbage, some with leeks in addition to the greens, and some recipes baked in a casserole. But no matter how it is prepared, colcannon is so common that a recipe is often printed on the back of a bag of potatoes. In this recipe, mashed potatoes, along with milk and butter, are added to cabbage that has been cooked with onion until tender. The result is a bowl of comfort, perfect alongside a corned beef dinner. Or, if you add some chopped corned beef to the colcannon, you will have a traditional English dish known as bubble and squeak. Place cabbage, onion, and water in a saucepan or Dutch oven and quickly bring to a boil. Reduce heat, cover, and simmer about 8 minutes until tender. Do not overcook. Add mashed potatoes, milk, butter or margarine, salt, and pepper. Mix well, stirring often until heated through. Serve warm as a side dish. A traditional way to serve colcannon is to mound it on a plate, create a well in the center, add a pat of butter to the indentation—the butter will quickly melt—and then pour cream around the mound of colcannon. Being such a simple dish, there really isn't much variation—but you will find other recipes that include kale instead of cabbage with green onion for additional flavor, as well as a vegan version which uses soy milk. You can also add cooked bacon if you like.